"I have had an on-going affair with Harper & Faye for at least 20 years. I have been able to acquire such diverse pieces of jewelry, all of which I still love. In the process I have also received an incredible education on all kinds of gems and jewelry. I love going into Harper & Faye because while I think I know what to expect, there are always surprises and treats. This is the only place I miss now that I no longer work in the financial district!" 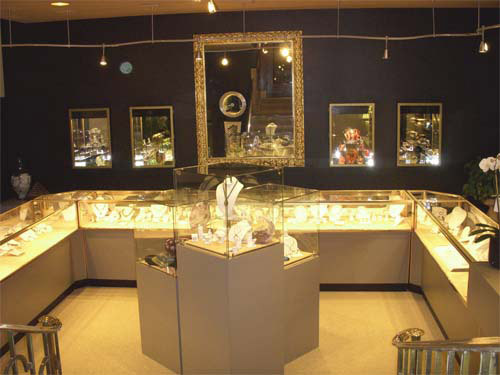 Harper & Faye Jewelers was established in 1983 to cater to the needs of Boston's Financial District clientele. The idea - though innovative at a time when malls ruled the Earth - was simple: Make it convenient for downtown professionals to shop where they work, and they will do so. And if you exceed their expectations, they will shop again! This was no small feat, given the sophistication and financial savvy of the legal, medical or financial professional who is our typical customer. To this end, we have gathered together a collection of fine jewelry, art and American crafts ranging from the amusing to the amazing; all backed by a level of service often unavailable at larger stores. It might seem odd for a fine jeweler to offer a collection of (sometimes whimsical) gift items; but the "one-stop shopping" idea works: you can come to us for an outstanding piece of jewelry for a major life celebration, or a present for your young niece! The one common thread is that no matter how small or large, what you buy from us must stand out from the crowd. Harper & Faye has changed with the times too, and we realize that "convenience" now means online shopping. Even our most loyal customers appreciate being able to "shop in their jammies", and our website lets you see our latest arrivals and Karen Nottonson designs without having to give up billable hours! We have tried to make our new website a reflection of our elegant but lighthearted store atmosphere; a place where you'll relax and browse. Welcome, and we hope you enjoy it! Consultations: "I would never have picked that- but it looks great on me!" Be it jewels for the bride, a special occasion or just sound advice on building a smart jewelry wardrobe, Karen's professional eye will help you choose what flatters YOU! Have old jewelry you no longer wear? Make an appointment to bring it in, Karen will advise you how best to "recycle" it into jewelry you'll wear every day. Why not call or email now and discuss your "wish-list"? Contact Us Now. Custom jewelry: Whether starting from scratch or remodeling your outdated jewelry, let Karen's imagination and experience make a success of your custom jewelry project. Unique among designers, Karen can create handcrafted jewelry in a number of antique and period styles, as well as cutting-edge contemporary designs. Use our fiery ideal-cut diamonds in your custom design, and take it to the next level of beauty and brilliance! Yes, we do outstanding and unique engagement rings; especially for those of you who want something different! Learn more about our Custom Jewelry Design. Harper & Faye is located at 60 Federal Street, in the heart of Boston's Financial district. Business hours are Tuesday through Thursday, 10am to 6pm, and by appointment.